Delafossite mixed metal oxides of the form BaCuO2 and BaCu1M1−xO2 (M = Ni, Fe and Co) were successfully synthesized following a sol–gel citrate method. The products, obtained after heat treatment under N2 at 800 °C, were characterized using several techniques such as: thermogravimetric analysis (TG), inductively coupled plasma atomic emission spectroscopy (ICP), X-ray diffraction (XRD) spectroscopy, Brunauer–Emmett–Teller (BET) surface area analysis, Fourier transform infrared (FTIR) spectroscopy and temperature-programmed reduction (TPR). The formation of the delafossite oxide structure for all solid powders was confirmed by XRD. The BET surface area of all catalysts was lower than 10 m2 g−1. The catalytic performance of the synthesized catalysts was evaluated in the vapor-phase hydrogenation of benzaldehyde. Benzyl alcohol and toluene were obtained through consecutive hydrogenation/hydrogenolysis reactions, while benzene was formed via a concomitant hydrogenolysis reaction. BaCuO.47Ni0.51O2 catalyst showed better activity at 250 °C with 98% benzaldehyde conversion. Under the same conditions, BaCuO.52Fe0.48O2 catalyst showed the highest selectivity for benzyl alcohol (84% at 20% of conversion). 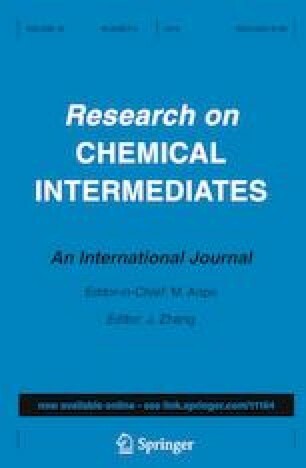 The online version of this article ( https://doi.org/10.1007/s11164-019-03792-6) contains supplementary material, which is available to authorized users.